Judy Pace Christie, after working as a journalist for twenty-five years, left the daily news business to open a consulting firm that works with individuals, businesses, and churches on strategies for meaningful life and work, including goal-setting, living fully, and balancing personal and professional lives. She is the author of Hurry Less, Worry Less; Hurry Less, Worry Less at Christmastime; and co-author of Awesome Altars. Judy and her husband live in northwest Louisiana. 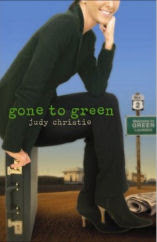 Lois goes from being a corporate journalist at a large paper in the Midwest to the owner of The Green News-Item, a small twice-weekly newspaper in rural North Louisiana. The paper was an unexpected inheritance from a close colleague, and Lois must keep it for at least a year, bringing a host of challenges, lessons, and blessings into her life. When Lois pulls into Green on New Year’s Day, she expects a charming little town full of smiling people. She quickly realizes her mistake. After settling into a loaned house out on Route 2, she finds herself battling town prejudices and inner doubts and making friends with the most surprising people: troubled teenager Katy, good-looking catfish farmer Chris, wise and feisty Aunt Helen, and a female African-American physician named Kevin. Whether fighting a greedy, deceitful politician or rescuing a dog she fears, Lois notices the headlines in her life have definitely improved. She learns how to provide small-town news in a big-hearted way and realizes that life is full of newsworthy moments. When she encounters racial prejudice and financial corruption, Lois also discovers more about the goodness of real people and the importance of being part of a community. While secretly preparing the paper for a sale, Lois begins to realize that God might indeed have a plan for her life and that perhaps the allure of city life and career ambition are not what she wants after all. I liked this book for the fact that Lois thinks she's going to a boring dinky old town and instead finds herself more involved in the community with more friends than she's ever had. She also finds herself more interested in the little things in life and making a difference in people's lives. Definitely an inspirational book, but with plenty of plot to keep you entertained!